Astoundingly, this suggestion of cost savings has been uncritically accepted by most policymakers. The lack of concern for taxpayers and consumers is striking and, at least for the political groupings who have a measure of accountability to voters, is playing with fire. Research carried out by Ethanol Europe tracing the origin of the Commission’s cost saving claim to its source raises lots of red flags. Price projections for advanced biofuels appear to derive from a single report that is not peer-reviewed and is by researchers who are commercially conflicted. Indeed, the data behind this report was obsolete even when it was written, and every prediction has proven wrong. 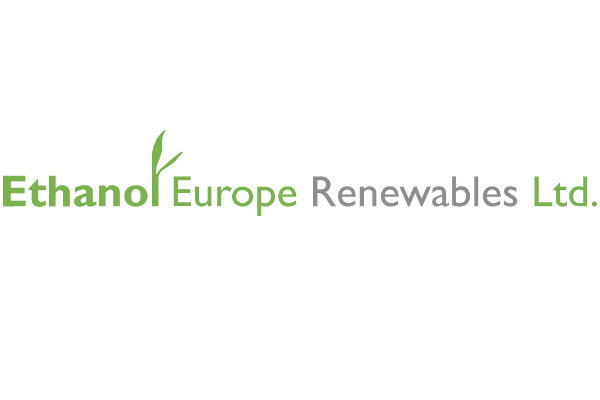 Ethanol Europe’s full research paper on costs here. No source is given for this claim in the RED II or its background documents. The impact assessment also argues that “Major cost savings of advanced facilities compared to conventional facilities are related to lower fuel costs compared to conventional biofuels and to a credit for valuable co-products from advanced processes”. The impact assessment pays little attention to the total costs of advanced biofuels, fails to acknowledge the prevailing low price of conventional biofuels and of conventional biofuel feedstocks, the prevailing high process costs for advanced biofuel feedstocks, the robust markets for (valuable) co-products of conventional biofuels, and the virtually non-existent markets for (not-so valuable) co-products of advanced biofuels. It does not provide a clear answer on how much the projected advanced biofuels production capacity investments will cost, or the production costs of such new investments. Remarkably, there is no meaningful discussion about how much more advanced biofuels will cost than conventional ones, but rather just an unsupportable conclusion that they will actually cost less. The 40% CAPEX saving figure seems to come from IEA-RETD (2015), which reports a survey’s finding “that retrofitting and colocation could generate savings of 40% CAPEX, which represents roughly a 20% total cost reduction”. It projects production costs of cellulosic ethanol in 2020 to be 25% less than corn ethanol and half the price of conventional wheat ethanol. That is an astonishing projection both from a technical standpoint and from a policy standpoint. From a technical standpoint, the wave of cellulosic ethanol plant closures in the past two years in Europe and the Americas despite a large price premium in every market for cellulosic ethanol, is remarkably at odds with this research finding. Conversion costs for lignocellulosic materials were projected to fall significantly (805 €/m3 in 2015 to 280 €/m3 in 2020). These costs have decreased little and this is the reason for plant closings. Raw material prices in 2015 were far lower than what the paper projected. 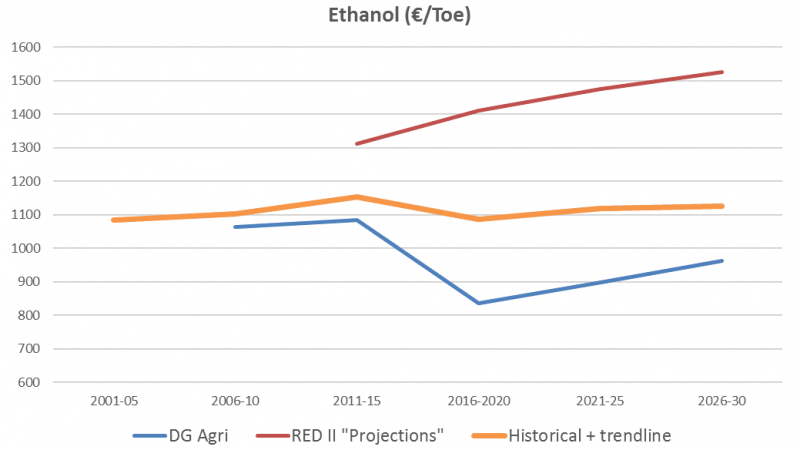 The price of conventional ethanol in Europe was far lower than production costs projected by Festel. Festel and his unreliable paper seems to be the Commission’s favoured source of information about biofuel prices. This is especially remarkable given that another part of the Commission, DG Agri, includes annual, respected and far more accurate price indications for biofuels. These DG Agri estimates were ignored (or dismissed) by the Commission’s RED II architects from DG Energy. How far these price follies extend into the Commission decision making process is unclear. Festel is not the only relevant data point. That would be good news if the second source was more reliable. It is not. The RED II impact assessment is based in Primes modelling commissioned by DG Energy, making its validity of key importance. The PRIMES biomass supply model is private, not open to public scrutiny and is maintained by the National Technical University of Athens. DG Agri’s Medium Term Outlook presents forecasts for a range of commodities that closely match historic figures and trends derived as linear regression from historic data. While the Commission does get data wrong, the DG Agri Outlook is globally respected and has a record of accuracy and transparent explanation. There is a large discrepancy between values of the Primes model, on the one hand, and either historic prices (and their derived trends) or the Medium Term Outlook as shown above and in the linked research paper’s charts. The conclusion is unavoidable; the Primes model is also entirely wrong. The European Commission’s policymaking on biofuels is rooted in the premise that advanced biofuels will soon be cheap and also that existing ethanol plants will simply convert into successful cellulosic ethanol plants. Reality is different. Advanced biofuels are not cheap, when they exist at all. Conventional biofuels are not expensive. Likewise, the idea that ethanol plants can or would convert to cellulosic plants is the mere pipe dream of an academic supported by the IEA and the Commission (instead of by the private sector) without any scientific grounding. The fact that the Commission got it so wrong on advanced biofuel costs argues for the need to reassess, fundamentally, the policy proposals. The conclusion is clear, reliance on advanced biofuels to replace oil in meaningful quantities in the short term is unjustified.